Pinch - Brain Scan. Vinyl EP. Bleep. 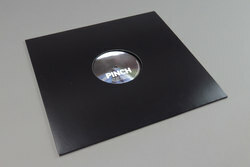 Pinch follows a seriously strong run of 12"s with Mumdance and Riko that led to the rinsing Water Bomb for Cold Recs, Pinch returns to cook up ya mind with Brain Scan, three tracks that envelop some of his most darkside productions to date. Diffusing elements of his classic underwater dancehall sound, Brain Scan is like the sort of jungle dread filled follow up to the Smith & Mighty classic. A ripping bassline against a backdrop of gyrating textures that bury themselves under your skin before the chain gang drums add a militant glare to the proceedings. Street Light revolves around a tight 2 step twist, while Abducted adds some classic DMZ sounds to the mix. Making for the most straight-ahead bass banger from Pinch for some years. Serious stuff.